In this interview Noisia say: "For drums we like to use Superior Drummer as well as one-hit sample libraries or even synth-based drums." "We used [XLN Audio] Addictive Drums quite a bit and it was processed. And we also used [Quantum Leap] Stormdrum and [Toontrack] Superior Drummer 2." Posij mentions using Superior Drummer multiple times in an Reddit AMA. At the 0:48 mark, the second to last channel strip says Superior Drummer in FL Studio's sequencer for Varien's track "Morphine". "Yeah, absolutely. That’s exactly what I use, you know, Superior Drummer, yeah." Mr. Bill outlines in this [interview](http://blog.liveschool.net/mr-bill-qa/) that he uses Toontrack Superior Drummer. In this video Dave reviews Superior Drummer 2. 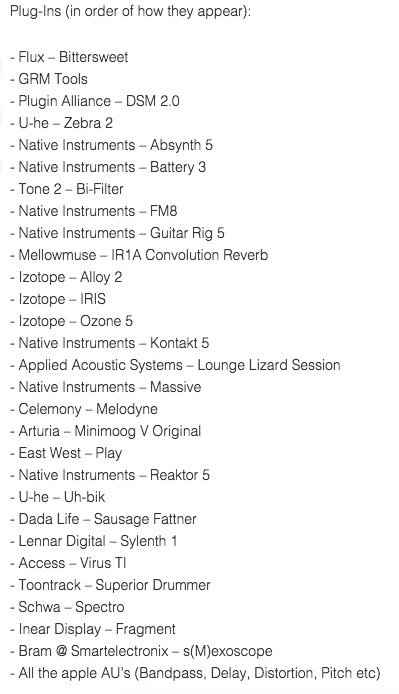 My favourite plugins would be the FM8, Surge, Synth1, Trash2, Kjaerhus classic, the waves API 2500 compressor, superior drummer, Drumatic 4, everything Fabfilter offers and of course Camelphat. What to say: it's Toontrack! and these drums are my friends. The item can be seen 0:41 into this video. At around 1:10 we see Garrett using Superior Drummer. Beautiful, Easy to Use and A Crucial tool. Suprior Drummer is a leviathan. The kit configuration possibilities are almost endless and then to step that further, each kit piece can be changed within the VST. With compatability for older EZX expansions for EZ drummer, this Virtual Instrument is something every producer should have. If you have Ez Drummer, Or EZ Drummer 2, I recommend that you upgrade to this ASAP. Superior is awesome and I not only have used this in depth with metal mix tests in the past, but I love adding things into my electronic music nowadays with it. I used this as part of the buildup/fill in my song "Launch"
I use it to customize drums kits and its sounds amazing! If you go to a studio and they don't have Superior Drummer I would think twice about recording there. This is a must have. Record drum tracks at home at 3am. To words for you LOVE IT!